The Backend to SAB has changed quite dramatically, if experiencing performance issues; try Reseting Safari then logging out of OS X, and log back in.
! !Safari Adblocker is NOT currently compatible with versions of Safari 5 and greater! 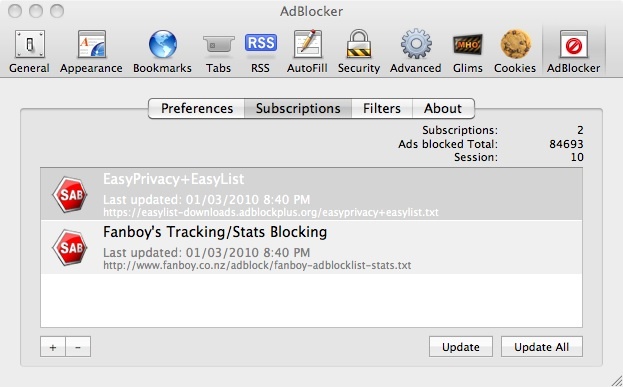 Safari Adblocker requires SIMBL which is conveniently included in the installer. Please consider giving a donation, to help with development costs. Its really up to you what you think Safari Adblocker is worth - personally i think a donation of $10 - $15 is a fair amount. June 11, 2010 - Version 1.9.8.5 - Italian localization, thanks Rosario C.
March 03, 2010 - Version 1.7.3 - Fixed crash when adding an empty filter, Fixed Safari hang/high CPU use when encountering "data:" url's, Fixed contextual menu implementation, New toolbar icon - Inspired by a design submitted by Robert Wolf. 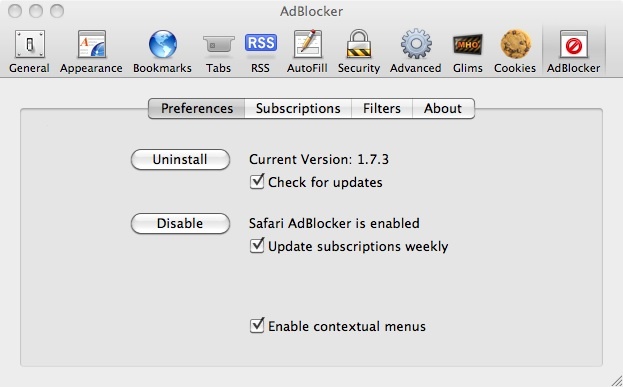 Install Safari AdBlocker from the installer, and access preferences through Safari's preference menu. To whitelist an object, use the convenient contextual menu, or alternatively manually add your filter and prefix it with "@@"
To whitelist 'all' ads for a particular site, use the contextual menu, or manually prefix your filter with "@@|"
**Note: whitelisting an object, overides all the block settings! Currently, only global element blocking rules are honoured. Site-specific rules are ignored. 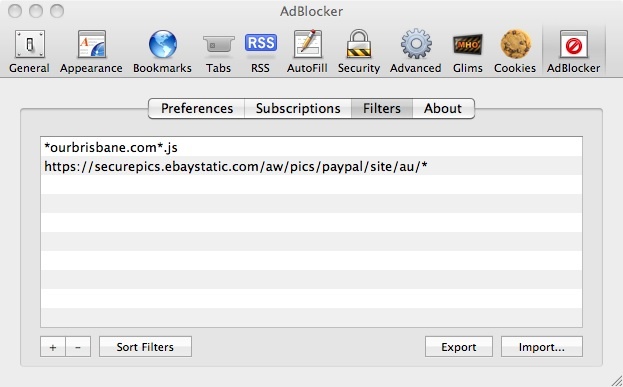 To block an element, manually add a filter and prefix it with "##"
e.g to block the element: div "id"="sponsored_ads"
Safari Adblocker was built using source code from SafariBlock (Apache 2.0 license), and uses SIMBL to inject code into Safari.